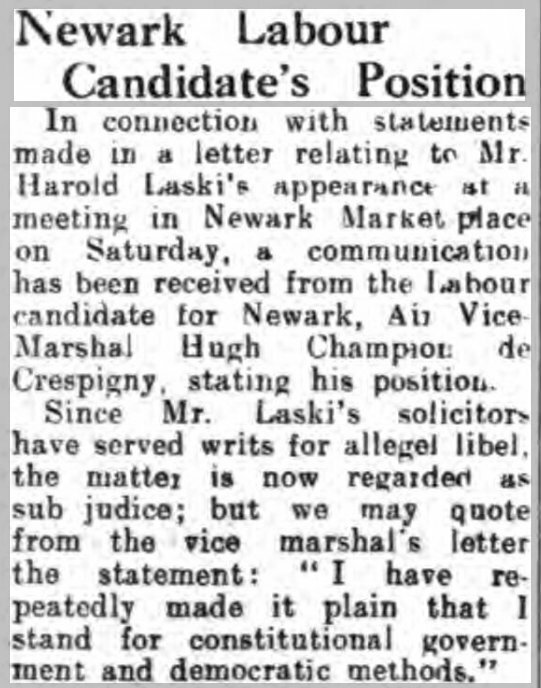 On 13April 1945, the Grantham Journal of 13 April 1945 noted briefly that Air Vice-Marshall H. V. Champion de Crespigny had been selected as the Labour Candidate for the constituency of Newark in Nottinghamshire, England. 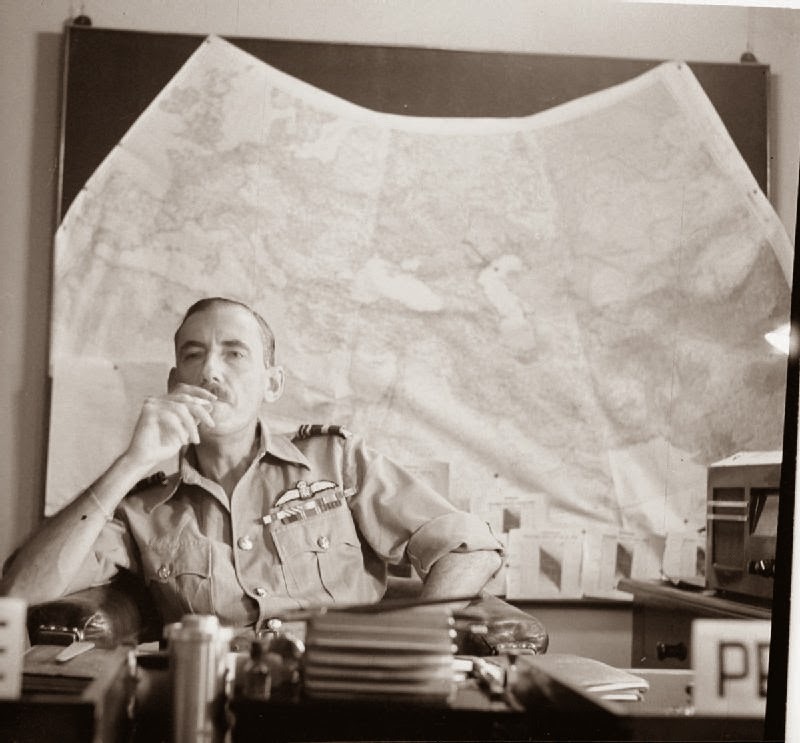 Air Vice Marshal Hugh Champion de Crespigny, Commander of the Royal Air Force in Iraq and Iran during World War 2, photographed about 1943, at his desk by Cecil Beaton. Photograph CBM 2192 from the collections of the Imperial War Museums retrieved from Wikimedia Commons. On Saturday 16 June 1945, Harold Laski, chairman of the Labour Party addressed a meeting of about 1,500 people in the Newark Market Place. Afterwards he was asked why he seemed to be openly advocating violence. Laski’s response was alleged to have included the comment that “If Labour did not obtain what it needed by general consent, we shall have to use violence even if it means revolution”. Nottingham Evening Post Friday 22 June 1945 page 6. Image © Local World Limited. Image created courtesy of THE BRITISH LIBRARY BOARD. The 1945 General Election was held on 5 July. There was an 11.7% swing to Labour, which won. In the Division of Newark Hugh Champion de Crespigny received 42.35% of the vote, but this was not enough to defeat the sitting member, the Conservative Sidney Shephard. Shephard held the seat, with 18,580 votes, or 45.09%. Compared to previous election results for the Labour party in Newark, Hugh de Crespigny had managed to continue the swing to Labour despite the Laski affair. During the war there had been an agreement that major parties would not contest by-elections in seats held by another party in the wartime Conservative-led coalition government, so when there was a by-election in 1943 in Newark no Labour candidate contested the seat. In the 1935 general election the sitting candidate, the Marquess of Titchfield, held the seat with 62% of the vote against the Labour candidate. In the 1950 general election, with 54% of the vote, George Deer the Labour candidate for Newark, unseated the incumbent Sidney Shepherd.